The feeling of acceptance sure appeals to all of us. Who doesn’t want to be accepted for exactly who we are, what we like and dislike, who we spend our time with, what we believe in, etc… It amazes me that not one single relationship I have ever known has ever just “accepted” one another just the way they are. This is how you met them, so why try and mold them into something else, it’s never going to work out. I have experienced our friends tell their other half some horrifying things, such as they wish they looked different, or were like someone else, lose some weight, stop hanging out with your friends, you see your family too much, stop dressing like that, etc…I mean really, I cannot imagine how that feels!! There is one thing to enhance your relationship by trying new things on a positive level if you both agree. Variety is the spice of life for sure, and making little changes to add fun and joy into your relationship is adventurous. If this is the person you want to spend the rest of your life with, you both will make sure you keep one another happy, that alone is the ultimate joy in a relationship. But to try and suffocate someone in a life they are not happy living is like suffocating yourself, it will be the cause of the death of your relationship. 1. Resentment sets in and your light, your glow, your person becomes completely shadowed and so does your relationship. Some people stay in this situation for years and waste so much precious time being unhappy instead of working it out or stepping away. They make all kinds of excuses to hang on to something for the comfort of what they know. They are so afraid of starting over or being alone, it is basically like not living. They have no idea how amazing it is on the side of the unknown where you can actually be happy, even if on your own. 2. Like a ticking time bomb you explode someday sooner or later. This is where I see people cheating, because it feels good for them to be ACCEPTED. But of course this is an escape, instead of facing the problem and dealing with it for good. Others finally leave the relationship and tell me how absolutely amazing life finally is to them, and they wished they had done it sooner. And yes there are sadly those that stay and eventually hurt one another. I must admit that I myself was guilty of this at one point. I learned real fast that if I didn’t change my ways, I would lose the love of my life. It was as simple as that, one quick decision to change for the better and I cannot believe how life changing that was for both of us. I advice the same for you. Life is too short to waste it on nonsense that will only steal energy, and time from your life. 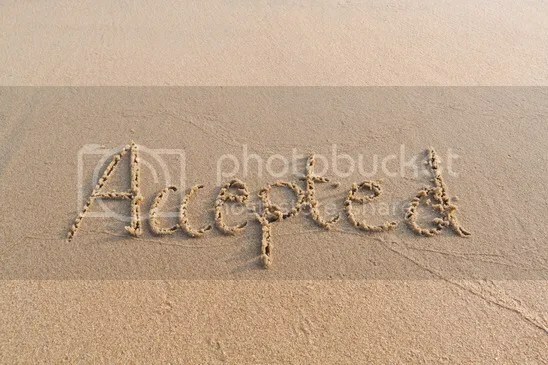 Accept and make sure you are accepted in return. Everything is a choice, and you are in total control. Living life to the fullest starts by having an abundant relationship, and everything else will fall into place, be happy!